Both of my daughters are selling Girl Scout Cookies for the first time. Orders will be taken until Jan. 25th. 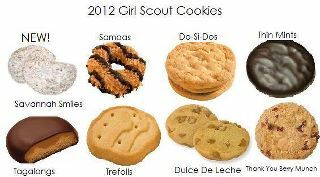 Please support my girls and the Scouts! If you don't eat the cookies, buy some for your Mom, Dad, Grandparents, Coworkers or boss! They'll love you for it! $4 per box.. You can also donate a box of cookies. They will be given to Yellow Ribbon Operation Moms & USO Navel. Girl Scouts of America advises to receive payment up-front if possible. This is preferred and appreciated. Check can be made payable to: Girl Scouts GCNWI. Thanks for considering! Distribution is Feb. 17, 2012.